Immediately upon purchasing, check the squash blossoms and be sure to remove the stamen and any bugs. Store in closed container on paper towels in the 'fridge. Best if used same day, of course. Wash gently before using and dry thoroughly on paper towels. Let the goat cheese come to room temperature. Blend with the cream and then add the pine nuts and thyme. Stuff each blossom, twisting the petals closed gently. Beat egg in a bowl and spread panko on a plate. Most recipes call for deep-frying, but I decided to go with pan frying. Use a frying pan big enough to accommodate the blossoms, fill it with 1/4 inch olive oil and heat to 350 degrees. 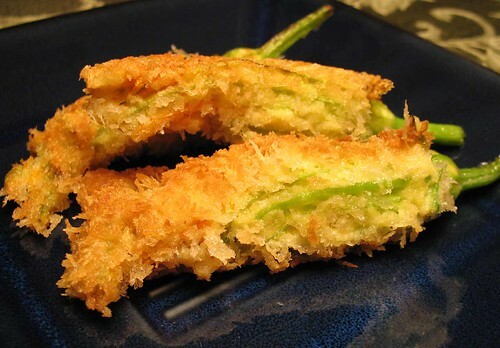 Roll each stuffed blossom in the egg wash and then in the panko and then fry until crisp and browned -- about 2 minutes per side. Notes: I'd never attempted fried squash blossoms before but the farmers' market had such lovely and colorful ones that I decided to give it a try. It went more smoothly than I expected and for my first attempt, I was more than pleased. The panko gave it a lovely crunch, though perhaps the thyme was a bit too strong. Overall, quite tasty.